Historically, the Wayuu nation is characterized by an organizational structure that is based in clans, with high mobility in its population and with extensive hunting and fishing practices. Today, these characteristics remain to a certain extent. When contact with Spanish culture occurred, the Wayuu people adopted shepherding and began staying in their residences for longer periods of time. Little by little, commerce became an important factor for obtaining goods and, additionally, it became a tool for connecting with immigrant cultures. After the establishment of the Republic, catholic missions became present in the territory. Nevertheless, the Wayuu culture endured throughout the years. Wayuu society presents a complex, matrilineal structure, composed of 30 clans, each one with their own territory and their own totemic animal. 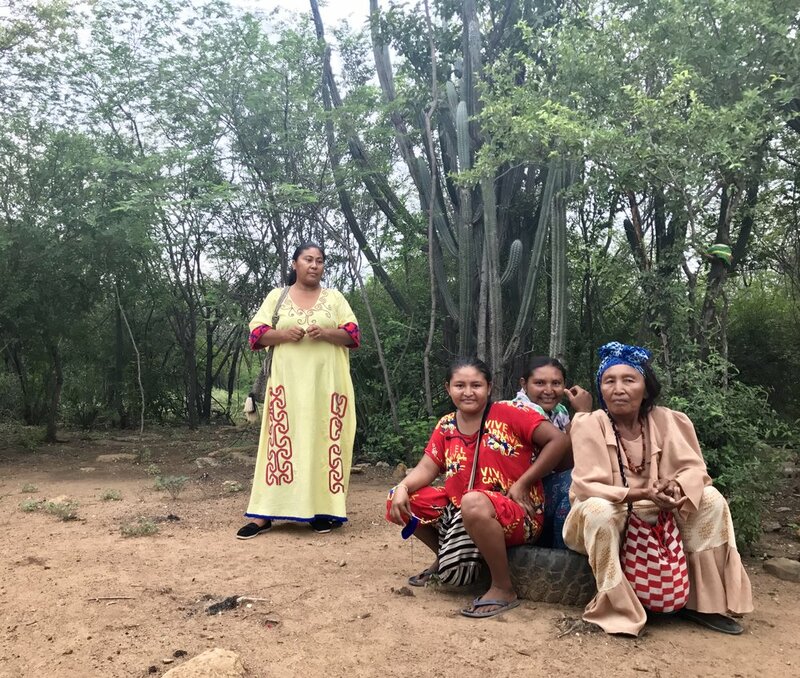 In their world view, the Wayuu indicate that their first people and their clans came from Wotkasainru, a land in Alta Guajira (Wayuu territory is divided into three areas: Alta, Media, and, Baja. The Alta Guajira being the tip of the peninsula, and the Baja Guajira, the area bordering the main land). Maleiwa, a central figure in their mythical universe, created them, as well as the casts that distinguish them: the Uliana, Jayaliyu, Uraliyú, Ipuana, Ipuana, Jusayú, Epieyú, Sapuana, and Jinnú, among others. Besides Maleiwa, the creator God and founder of their society, Pulowi and Juvá, are a couple who are attributed with generating life. Pulowi, the female, is related to the winds and droughts. Juvá, is a male that hunts and kills. Wanülü represents the ill of sickness or death. Marriage and burial are two central moments in the life of the Wayuu. The Wayuu woman is independent and active, playing an important role as the conductor and organizer of the clan. Wayuu women are politically involved in their society, and it is the female authorities who represent their people in public spaces. Within the extended family, the chief authority is the maternal uncle, who intervenes in all the domestic and family issues. Within the nuclear family, the mother’s brother is who guides the children, not the biological father. The social structure of the Wayuu is strongly associated with the principles of their cosmogony and ways of their mythical representation. Dreams are a very important aspect of daily life, as they explain a collective and individual reality, and they are granted prophetic powers. The Wayuu are distinguished by their textile work. Weaving goes beyond being a cultural practice and an ancestral heritage. It is a way to express their life, how they conceive it and wish to express it. This well hought out art form is thoroughly celebrated. The observation of their vast variety of weaving patterns, allows them to understand the spirit that guides their actions and thoughts. The majority of Wayuu people are bilingual in Wayuunaiki and Spanish. Their autochthonous language comes from the Arawak linguistic family, and counts with two dialectical forms, which do not impede the communication between those who speak them: The Wayuunaiki “arribero” (pertaining to Alta Guajira), and the Wayuunaiki “abajero” (of the Baja Guajira). Their more recent history is characterized by oil production, the operation of the biggest open pit coal mine in Latin America, “El Cerrejón,” and the opening of the sea port in Alta Guajira that took place in the 1980’s. The exploitation of natural resources has amounted to severe problems for the Wayuu nation, and have generated labor dependency among the population.